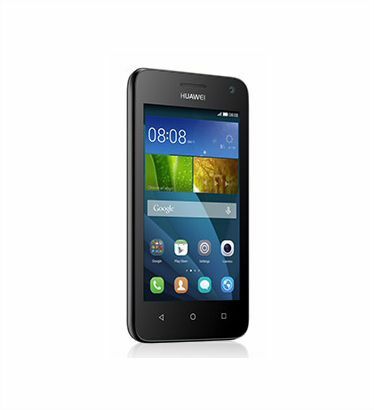 The black Huawei Y3C Dual SIM smartphone is an excellent choice for those seeking a balance between functionality and powerful performance. The 4inch IPS LCD capacitive touchscreen casts sharp images, animations, videos, and other onscreen elements at a screen resolution of 480 x 854 pixels. A Mediatek MT6582 chipset with a Quad Core 1.2GHz Cortex A7 processor powers this phone, letting you enjoy using your applications sans all glitches that interrupt. You can seamlessly switch between tasks on this phone with a 512MB RAM module. The Huawei Y3C Dual Sim features a 4GB internal storage that you can use for keeping all your multimedia files safe and at the ready whenever you need them. Adding to the ability of this device is the Android v4.4.4 KitKat operating system, which offers a user friendly interface that facilitates easy maneuvering across various applications. The Huawei Y3C Dual Sim camera on the back snaps highly detailed pictures and shoots clear videos. This 5MP camera is supplemented with a dual flash that enables bright pictures even when the lighting conditions aren't quite the way you'd like. This smartphone is designed to make efficient use of its Lithium Polymer 1730mAh battery that supplies a talk time of approximately 7 hours and 30 minutes on the 3G network. 94.8% of users recommend this product to a friend. I bought this phone as a second phone for work and it did an amazing job. Neat Phone that you can slip into your pocket, a bit heavy, but I think it is due to dual led at the back, battery life is good, you can browse facebook and use Whats app, and still have the phone functioning a full day. Loading time, battery life, dual led flash light, reliable.